With an upstairs balcony that overlooks the Pasadena City Hall and San Gabriel Mountains, as well as spectacular ballroom spaces that have been designed specifically to serve as opulent event spaces, it’s easy to see why Noor has become one of Los Angeles County’s most popular wedding venues. Not only can you hold a romantic wedding ceremony here, with completely customized decorations and ambiance, but the staff will do a rapid “flip”, transforming it into a lavish ballroom reception. Choose the spacious Sofia Ballroom, with its elegant Art Nouveau foyer, burnished wood bar and exquisite chandeliers, which can hold around 350 seated guests. It also boasts an alfresco lounge balcony with stunning nighttime views across the city skyline. Or opt for the more intimate Ella Ballroom which caters to around 150 and features Venetian plaster walls and a chic jet black bar that exude sophisticated elegance. With so many ornate decorative features, your wedding photos will be imbued with Noor’s graceful style, or you can plan your couple portraits and bridal party portraits wedding shoot at the nearby Pasadena City Hall, surrounded by its stately whitewashed colonnade. Noor’s expert wedding coordinators will help you plan every aspect of the day, down to the tiniest details, and ensure that your wedding is executed flawlessly by their catering team and service attendants. 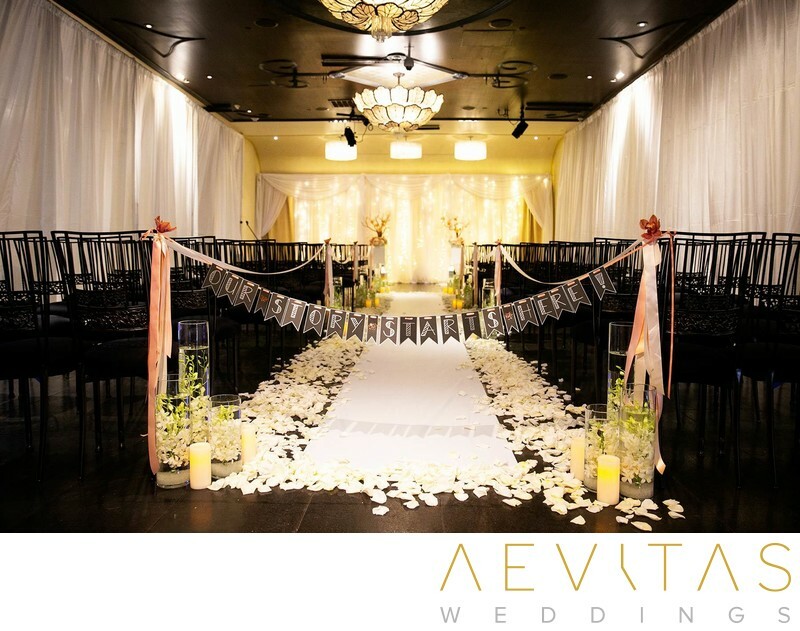 As a dedicated venue space that strives for flexibility, you can personalize your event to create a day that is truly unique and create a wedding photo backdrop that reflects your style and inspirations. Noor provides indulgent menus from their in-house caterers that can be tailored to satisfy your culinary desires, as well as a full bar with a dedicated team at the helm. You can opt for a photo booth to capture some silly shots of you and your guests, or use their in-house DJ who knows how to get the party started and fill Noor’s spacious central dance floor. For couples who want stress-free planning, with everything in one location and the ability to transform the space into their wildest wedding day dreams, then Noor provides the perfect backdrop to make it a reality.